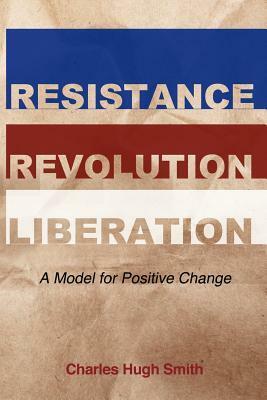 Charles Hugh Smith’s latest book, Resistance, Revolution, Liberation- A Model for Positive Change, will stand as an all time favorite of mine for so many reasons. With a clarity of vision that cannot be easily placed anywhere on the political spectrum of left/right, his latest book offers up ways in which to resist the consumerist culture brought about by easy credit and an elite central government. Economic growth that requires ever increasing consumption of resources and centralizes the power of the State hurts us personally, collectively, harms the environment while redistributing risk into the culture at large and requiring all of us to take on more and more debt. All risk associated with malinvestment gets passed into the system, which in turn offers incentives for more risks to be taken. Offering home mortgages with little or no down payment redistributes the risk of defaulting on loans away from the buyer and into the economy at large. Bankers, investors and lawmakers also redistribute risk when they are “too big to fail,” and thrive off of the credit and taxation that comes from more and more debt a consumer driven economy creates. The elites become very good at controlling and gaming the system and making sure that the debtors have just enough goodies to keep them distracted and continue working to pay off the increasing debt while they lobby and legislate themselves into a protected status. This may work for awhile, but with the passing of time, and the increase in rules and regulations added to fine tune the malfunction created by misallocation of limited resources, the bubble economy and culture begin to move into a state of steady decline. What we have now is clearly not sustainable and we may in fact be in for a very rude awakening as our economy and way of life implodes in the perhaps, not too distant future. Charles offers up ways in which individuals can free themselves from the cultural madness by the choices we make in every aspect of our lives. Better food choices can be made by learning how to grow our own food or cooking more of our own meals from whole food sources. We can downsize our lives by living without some of the technology that causes friction, increases debt and encourages more phony growth of the State and Corporations. He writes persuasively about the isolating effects of electronic technology pointing out that what so-called social networking devices really offer us are more ways to do things alone. These devices may seem to give us a sense of control but at the expense of authentic relationship in which we are truly engaged with someone else’s otherness. Perhaps that is why we tolerate less and less of each other’s differences and sometimes find it hard to listen and communicate effectively. In exchange for an identity as a member of a family or community in relationship in service to each other, we embrace an identity dependent upon the pursuit of consumer signifiers such as clothing fads, what car we drive, what home we live in, or our political preferences, in the hopes of setting us apart and being someone. None of these things gives us a lasting identity or sense of contentment because consumer fads are aimed at obsolescence in order to entice us into making the next purchase. Who hasn’t felt the emotional draw of purchasing some goodie or product that promises us some vaguely defined good? Using great analogies and refusing to fall into the trap of a prepackaged political identity Charles recognizes that all of our political choices are false choices because the game of politics requires all the players to invest their belief and trust in a corrupt system and by doing so, becoming part of the problem in order to be in the game. Hence both presidential candidates gladly take campaign contributions from Bank of America or any corporation because millions of dollars are now required to garner enough support to be elected. Once elected, the large corporate interests are paid back through legislation that grants them some benefit over their competitors. Corruption perpetuated by an Elite few in our culture is not only economically, environmentally and globally unsustainable, but as noted previously, personally damaging by conscripting our identity to that of a consumer, branded and defined by the things we buy, where we shop, where we work and who we vote for, most of which do very little to bring personal satisfaction or deepen our relationships. As someone who grew up in the shadow of sixties idealism of revolution and liberation, this book helps define for me what went wrong by comparing those ideals to where we find ourselves 40 years later. The wonderful percolation of ideas from the sixties that called for freedom through transformation of ourselves and the culture has been hijacked. The call for personal transformation has been packaged over the last few decades into political and corporate solutions by elites who now have access to power through the most influential structures of American culture- central government, the media, educational institutions and corporations. Using information and entertainment technology political and corporate elites easily entice many of us to seek out meaning and identity as consumers of anything that distracts and divides us, thereby protecting the status quo of a corrupt State that will inevitably cause the breakdown of the system they sought to protect.